The countdown to 2015 is in full effect, and with just a few days left until the ball drops, we’re teaming up again with our friends at Mothers Against Drunk Driving to combat drunk driving and ring in the New Year right with safe, responsible rides. For many of us, New Year’s can be one of the most fun nights of the year. Unfortunately, it’s also one of the deadliest for alcohol-related crashes. Last year, on New Year’s Day, 70 lives were unnecessarily lost due to drunk-driving: mothers, daughters, fathers, and brothers whose lives were tragically cut short. Safety is Uber’s top priority, and that commitment extends throughout the communities of which we are proud to be a part. With Uber, a safe, reliable, hassle-free ride is always a few taps of a smartphone away, which is a big reason why our driver-partners were able to help reduce the rates of DUIs in a large metropolitan city like Seattle by 10%. This New Year’s Eve, between 6pm on December 31 and 6am on January 1, Uber is donating $1 of every ride nationwide to MADD when you enter the promo code MADDNYE. Please join us in supporting MADD’s work to end drunk driving and aid the victims and survivors of drunk driving crashes. With all the planning that goes into the perfect New Year’s Eve celebration, Uber and MADD urge you to plan ahead for the most important part of the night: the ride home. This holiday and throughout 2015, make the right choice and designate a non-drinking driver. And if your choice is Uber, please take a minute to thank the thousands of men and women making that safe ride possible. Plan to keep the car at home and ride with Uber! 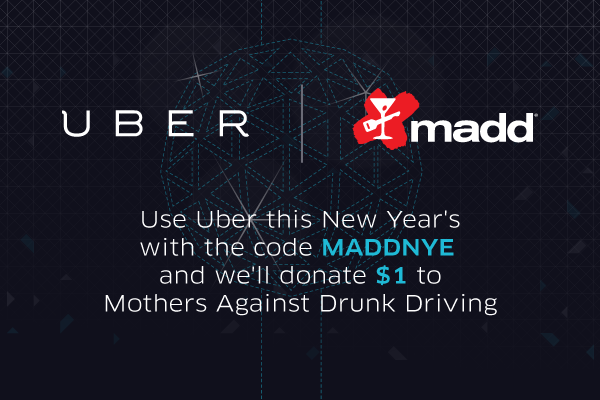 Enter the code MADDNYE before you ride, and we’ll donate $1 to Mothers Against Drunk Driving. Be safe and ring in the New Year right!